Painter of animals, landscapes and genre scenes; etcher and sculptor. Florent Crabeels was a pupil of Willem Linnig for painting and of Guillaume Geefs for sculpting at the Antwerp Academy. He mainly worked in the surroundings of Wechelderzande, in the Antwerp Campine region. He was a co-founder of ‘l’Art Indépendant’ in 1886. 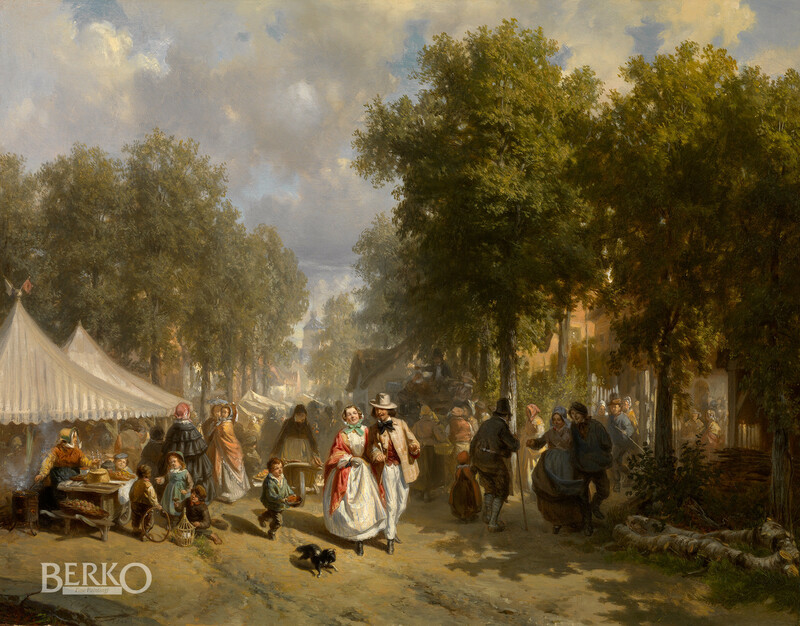 He painted exuberant village fair scenes. “Heather in Summer” figured in the Exhibition of Belgian Art in Brussels in 1905. His works, all shining with light, have nothing to do with the conventional colouring of the pleiad of artists of his time; he was even one of the first to break with convention and to pattern himself on nature. The countryside is predominant in his works; they are evidence of his perseverance and the perfect probity of his art. P. & V. Berko, "Dictionary of Belgian painters born between 1750 & 1875", Knokke 1981, p. 131.